This a stretch in being healthy and or low-iodine as its covered in cheese, but I think it must be a little better than its normal counterpart. I never know what to do with Butternut Squash other than soup, this was my attempt at being creative for dinner. I started off prepping in the morning I don’t really think you need to, but I was using it as an excuse to not work out (another issue, for another day). 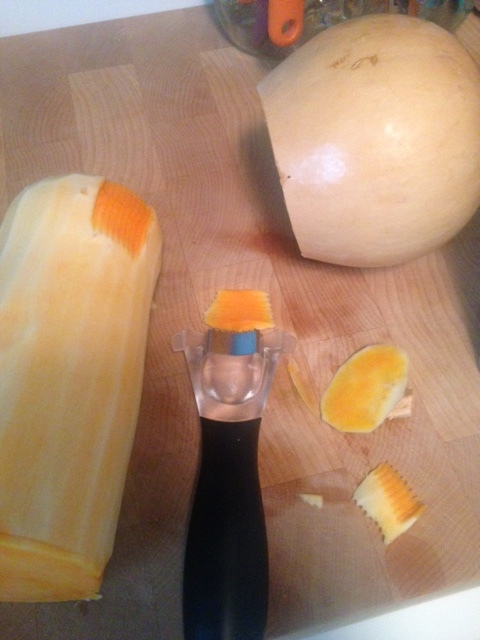 First thing was to conquer the squash I wanted to make long strips so it looked like an actual lasagna, I cut the bulbous part off, peeled the long part and cut it in half. I then tried to use the tool that takes the corn off the cob I thought it would make strips for some reason, it didn’t it, took out chunks and almost a piece of my hand. 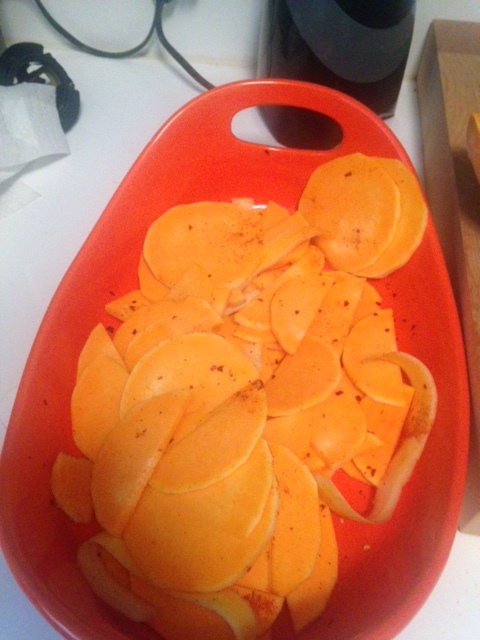 Then I tried a peeler, it was to thin, I settled with cutting thin pieces off in semi circles, it will work. 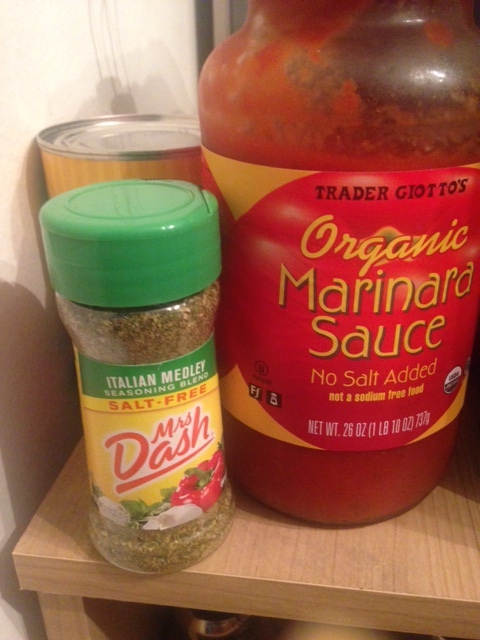 I seasoned the squash with Mrs. Dash’s Italian Seasoning since you can get it salt free. Next the sauce. I will in no way pretend I am master at tomato sauce and/or gravy, but it tastes good to me, and husbands says “it’s ok”, and for him, sadly, that is high praise. I used Trader Joe’s organic marinara sauce, their organic chopped tomatoes,Cayenne pepper, red pepper flakes, and the Italian seasoning again. We like spicy, but I’m sure you don’t need to add that. I threw that all in the slow cooker, with 93% lean ground beef, a slow cooker liner, which are fantastic if you hate to wash the slow cooker, and put it on low. Once we were home we put the squash in the oven on 350 for half an hour, it cooked way faster than I thought it would, and lost a lot of size, it lost any resemblance to what I thought would be vegetable lasagna, so I changed course a little. We layered the squash with cheese, husband wanted mozzarella and ricotta. We went with pepper jack and goat cheese, poured the meat sauce over the squash, layered the cheese and put it back in the oven till it all melted. 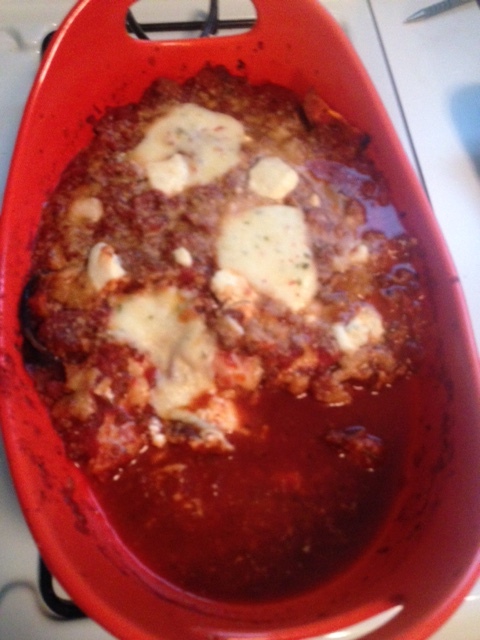 All in all it tasted pretty good and sort of resembled lasagna in the end! It would be just as easy to do this all the same evening, put the sauce in a pot and cook it while the squash cooked. After a scoop or two had been taken!